The Constitution Bench of the Supreme Court, comprising Chief Justice R M Lodha, Justice H L Dattu, Justice Chandramauli K R Prasad, Justice Madan B Lokur and Justice M Y Iqbal has delivered today, the much awaited Mullaperiyar case. The judgment was reserved in last August 2013, after a prolonged hearing. By delivering the judgment, CJI held that the Kerala Irrigation and Water Conservation (Amendment) Act 2006 which was brought in response to the Court cannot sustain under the Indian Constitutional Scheme of things and we should maintain the doctrine of separation powers. The legislature should not be allowed to overreach the Court orders, and on that note the Act was declared unconstitutional. As a solace to Kerala, the Supreme Court has directed formation of a committee which would look into the periodical safety and other aspects. In a way Kerala has lost completely in the protracted legal battle with its neighbour Tamil Nadu. It is also observed that the Dam is safe and the height of water level can be raised. (i) The suit filed by the State of Tamil Nadu is maintainable under Article 131 of the Constitution. (ii) The suit based on a legal right claimed under the lease deed executed between the Government of the Maharaja of Travancore and the Secretary of State for India in Council on 29.10.1886 is not barred by the proviso to Article 131 of the Constitution. (iii) The State of Kerala (first defendant) is estopped from raising the plea that the lease deed dated 29.10.1886 has lapsed, in view of the supplemental agreements dated 28.05.1970. (iv) The lease deed executed between the Government of the Maharaja of Travancore and Secretary of State for India in Council on 29.10.1886 is valid and binding on the first defendant and it is enforceable by plaintiff against the first defendant. (V) Kerala Irrigation and Water Conservation (Amendment) Act, 2006 is unconstitutional and ultra vires in its application to and effect on the Mullaperiyar dam. (VI) The rights of Tamil Nadu, crystallized in the judgment dated 27.2.2006 passed by this Court in W.P. (C) No.386/2001 cannot be nullified by a legislation made by the Kerala State legislature. (VII) The earlier judgment of this Court given on 27.2.2006 operates as res judicata on the issue of the safety of Mullaperiyar dam for raising water level to 142 ft. and ultimately to 152 ft. after completion of further strengthening measures on the Mullaperiyar dam. (VIII) The plea raised by Kerala relating to the lease deed dated 29.10.1886 and structural safety of Mullaperiyar dam have been finally decided by the judgment of this Court dated 27.2.2006 and Kerala is estopped from raising or re-agitating these issues in the present suit. (IX) Kerala cannot obstruct Tamil Nadu from increasing the water level of Mullaperiyar dam to 142 ft. and from carrying out repair works as per judgment dated 27.2.2006. (XI) to allay the apprehensions of Kerala- though none exists - about the safety of the Mullaperiyar dam on restoration of the FRL to 142 ft., a 3-Member Supervisory Committee is constituted. The Committee shall have one representative from the Central Water Commission and one representative each from the two States – Tamil Nadu and Kerala. The representative of the Central Water Commission shall be the Chairman of the Committee. The Committee will select the place for its office, which shall be provided by Kerala. Tamil Nadu shall bear the entire expenditure of the Committee. 1. Whether Section 108 of the States Reorganisation Act, 1956 is unconstitutional? 2. Whether the jurisdiction of this Court is barred in view of Article 262 read with Section 11 of the Inter-State Water Disputes Act, 1956? 3. Whether Article 363 of the Constitution bars the jurisdiction of this Court? 4. Whether disputes are liable to be referred to Arbitration? 5. Whether the raising of water level of the reservoir from 136 ft. to 142 ft. would result in jeopardising the safety of the people and also degradation of environment? The Supreme Court answered in negative all the issues raised above and dismissed the Writ Petition. The Court in its 2006 judgment held that “we find no substance in the contention that there will be adverse effect on environment. Regarding the issue as to the safety of the dam on water level being raised to 142 ft. from the present level of 136 ft, the various reports have examined the safety angle in depth including the viewpoint of earthquake resistance. The apprehensions have been found to be baseless. In fact, the reports suggest an obstructionist attitude on the part of State of Kerala. The writ petition and the connected matters are disposed of by permitting the water level of the Mullaperiyar dam being raised to 142 ft. and by permitting the further strengthening of the dam as aforesaid “ . After the three judge judgment, which was delivered on 27/02/2006, an interesting legislative action took place. The State of Kerala, apparently to overcome the Judgment amended its ‘Kerala Irrigation and Water (Conservation) Act’ in March 2006 itself and Mullaperiyar dam was designated as a Scheduled dam, treating it as endangered dam, and the water level was restricted to 136ft. Against the legislative response to the Supreme Court judgment by Kerala, the State of Tamil Nadu invoked the original jurisdiction of the Supreme Court under Article 131 of the Constitution and filed an Original Suit in the Hon’ble Supreme Court (OS No. 3 of 2006) against the provisions of the amended act in its application to the Mullaperiyar. Their main contention was that as per Section 108 of State Reorganization Act, 1956 Kerala State Legislature is not competent to legislate and impose restrictions over Mullaperiyar dam and also sought a declaration to declare the Kerala Act unconstitutional. It was contented that the amendment brought by Kerala was in fact to get over the Judgment of Supreme Court which is impermissible in law. Whether the suit is maintainable under Article 131 of the Constitution of India. 3. Whether the rights of the plaintiff, crystalised in the Judgment dated 27.02.2006 passed by this Court in WP(C) NO.386/2001 can be nullified by a legislation made by the Kerala State Legislature? 4. (a) Whether the judgment dated 27.2.2006 of this Court in WP(C) No.286/2001 operates as res judicata, in respect of all or any of the defences set up by the first defendant in its written statement? (b) Whether the pleas relating to validity and binding nature of the deed dated 29.10.1886, the nature of Periyar River, structural safely of Mullai Periyar Dam etc. raised by the first defendant in its defence, are finally decided by the judgment of this Court dated 27.2.2006 in WP(C) No.386/2001, and consequently first defendant is barred from raising or re-agitating those issues and pleas in this suit, by the principle of res judicata and constructive res judicata? 7. Whether the lease deed executed between the Governments of the Maharaja of Travancore and Secretary of State for India on 29.10.1886 is valid, binding on first defendant and enforceable by plaintiff against the first defendant. 8. Whether the first defendant is estopped from contending that Periyar River is not an inter- State river. 10. Whether the first defendant can obstruct the plaintiff from increasing the water level of Mullai Periyar Dam to 142 ft. and from carrying out repair works as per the judgment dated 27.2.2006 of this Court in WP(C) No.386/2001. 11. To what relief is the plaintiff entitled to? (iv) The effect of decision of this Court in Mullaperiyar Environmental Protection Forum vs. Union of India & Ors., (2006) 3 SCC 643 in the context of aforereferred constitutional provisions.. The CB, faced with factual questions came during the hearing, thought it fit to constitute an empowered committee as accordingly a five member committee was formed headed by former CJI justice A.S Anand and Justices K.T Thomas and A.R Lakshman as members . 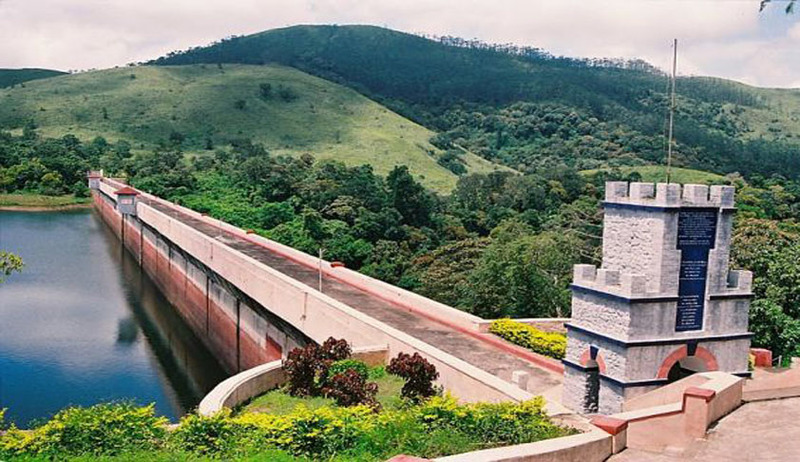 The Empowered Committee filed its Report to the Court stating that as per the the tests, investigations and studies conducted by them, the Old Mullaperiyar Dam is hydrologically, seismically and structurally safe for holding water up to 142 ft. The report of empowered committee strengthened the case of Tamil Nadu before the Supreme Court.